Use this plate size optical illusion to feel full eating less. So I have been portion controlling / reducing for a few months now and what I found has worked really well for me is gradually shifting down to a smaller dinner plate. I started with my normal one which seemed to be half the size of Australia and fit more food on it than I could ever comfortably eat. Then I switched to a normal / small plate. I noticed after a few weeks of doing this my pants fit a little looser. Then I switched to a dessert plate or side plate. I have been using the side plate for a month and have no cravings, always feel comfortably full after my meal and have lost inches off my waist and hips. This is with very lax attention to my walking schedule. I haven't changed much else except the size of my plate and therefore my portions. The thing is I can't fit heapings of food on this plate because it falls on the floor, and generally by the time I have finished eating I don't want anything else. I was reducing my portions by about a third in the beginning but my plate looked so empty that I would often fill it just to get rid of the lonely looking space. Just a possibility for maybe some of those people out there who feel like the big empty space on their plate calls for more food at dinner time and want an easy way to reduce your food intake. Great tip! Reducing portion sizes with smaller plate sizes works because we can trick our brain into thinking we're eating more than we are. Think optical illusion. The result of this illusion is eating less without feeling deprived or hungry. I thought this sounded like a bunch of hooey when I first heard about it 30 years ago. When several clients reported using smaller plate sizes and losing weight, it quickly became part of my weight loss program. Over the years and thousands of people later, it has worked so well I included it in my book. It's one of the ten ways people increase portion sizes without realizing it. Fast food is not the only thing that's been super-sized. 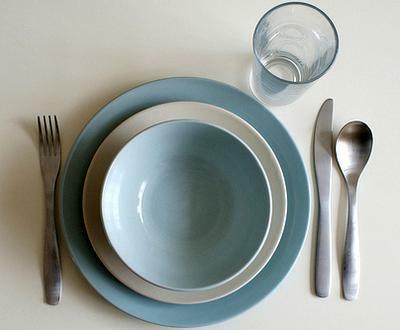 Dinner plates in 1960 averaged 8.5-9 inches and could hold about 800 calories. By 2009 plates grew to 12 inches on average holding approximately 1900 calories. Plate sizes have increased 33% since 1960 and a lot of data suggests a strong correlation between the rise of obesity and plate size. It's human nature, the more food we're served, the more we eat. How much we eat has little to do with whether or not we're "full." Rolls, Morris and Roe's research on "Portion Size of Food" demonstrates this phenomena. Cornell University's research takes this further in "Plate Size & Color Suggestibility." Use a 10" or smaller plate. Look for color contrast between plate and food. White works well for most foods. You want a clearly defined edge of food on the plate. Reduce color contrast between plate and placemat or tablecloth. This helps increase the illusion of larger food portions. You can put the whole family on a diet by simply switching to smaller plates, bowls and glasses. Most people won't notice a difference in the amount of food they're eating. Or, get the family actively involved and demonstrate the effect of this optical illusion. Set up a 12" plate and 10" plate with the exact same amount of food on each and ask which plate has more food on it. Slow down. Give your brain time to get the signal from your stomach it's full. Introduce an interesting topic for conversation. Start the meal with less calorie dense foods like salad, raw vegetables, etc. Prepare only enough food for the meal to reduce mindless snacking and picking of leftovers. Walking as little as 30 minutes a day is enough to reduce your appetite. May take a week or so before you notice, but if you're like most people that take up a walking program you'll notice a significant reduction in food cravings and increase in control of what and how much you eat. More about walking and the best exercises for weight loss, here. Excellent! Thanks again for writing in and sharing this portion control with plate size tip.